65% of consumers consider vehicle videos to be an important part of their car-shopping process. Most car shoppers prefer videos between 30 seconds and 2 minutes. Car shoppers find videos that show the vehicle exterior/ interior and design / feature overviews the most helpful. 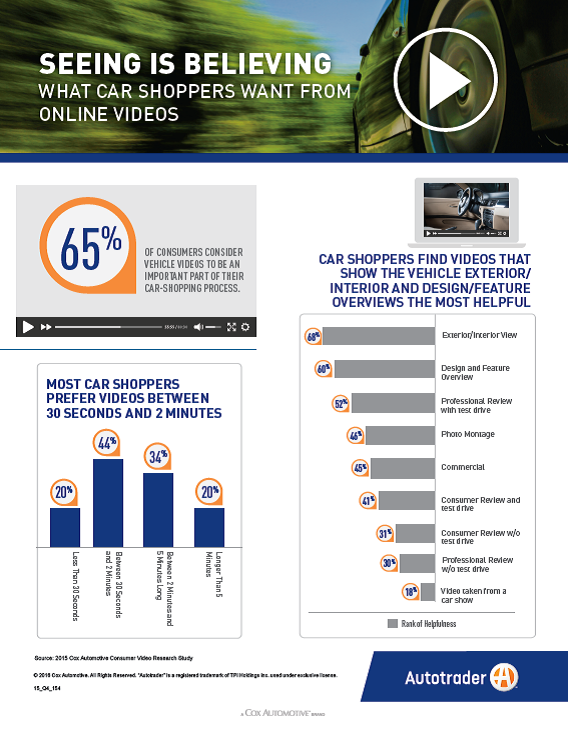 The 2015 Cox Automotive Consumer Video Research Study reveals what car shoppers want from online videos including: ideal length of videos, what car shoppers want to see in videos and just how important vehicle videos are in the shopping process. Download this information sheet to learn what types of video content shoppers find most helpful, and the ideal video length.